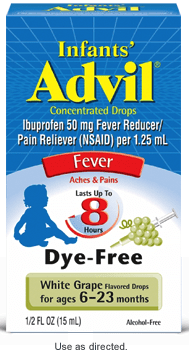 Hot Infant or Children's Advil Printable Coupon = $1.98 Each at Walmart! Hot Infant or Children’s Advil Printable Coupon = $1.98 Each at Walmart! Go Like Children's Advil on Facebook and you'll be able to get a high-value Advil printable coupon for Buy 1, Get 1 Free on either Infants' Advil or Children's Advil! 4-ounce bottles of Children's Advil are on sale for just $4.96 at most Walmarts right now. Combine that with the sweet Ibotta offer for an extra $1 off Children's Advil or $1 off Advil Infant's fever-reducing concentrated drops and you're getting an excellent deal on name-brand meds for your little one! Be sure to Register for iBotta and download the FREE app (directions here) to get this extra-low price on Advil! If you sign up through this link you’ll also get $5 cash paid via Paypal for FREE! Final price: Just $3.96 for two. That makes them just $1.98 each!